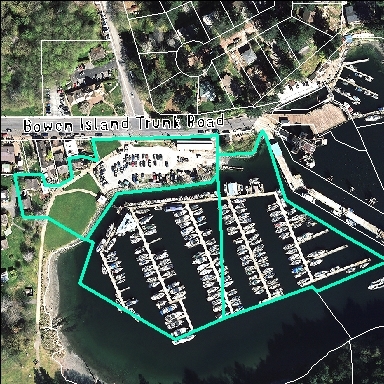 431 Bowen Island Trunk Road (shown on map) is the site of the Union Steamship Marina. The marina has applied to amend the Land Use Bylaw for permission to build up to 6 floating buildings and up to 16 dwelling units to house marina staff. The buildings would be governed by a Housing Agreement requiring that the units be available for Bowen workers from May to September. The proposed bylaw and background material may be viewed on this page below, or at Municipal Hall between 8:30 AM and 4:30 PM, Monday through Friday (excluding statutory holidays). Submissions may also be made to Mayor and Council at the public hearing. To ensure a fair process, submissions cannot be accepted once the Public Hearing has ended. Bylaw No. 461, 2018 cited as “Bowen Island Municipality Land Use Bylaw No.57, 2002, Amendment Bylaw No. 461, 2018. That Council refer Bylaw No. 461, 2018 to a Public Hearing. That Council direct staff to prepare a draft Housing Agreement and Sewer Covenant based on the conditions outlined in the January 18, 2019 report from the Manager of Planning and Development, for consideration prior to Public Hearing. That Council direct staff to report back at second reading to address Council’s concerns relating to sewage management and treatment for the proposed units. 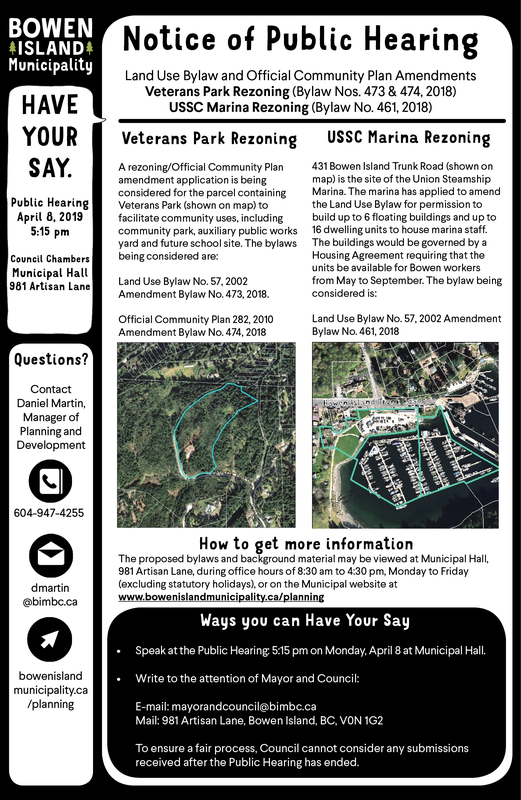 That the Manager of Planning and Development be directed to amend Bylaw 461, 2018 to remove Bowen Island Municipality Land Use Bylaw No. 57, 2002 Amendment Bylaw No. 399, 2015-Schedule A. That the Manager of Planning and Development be directed to amend Bylaw 461, 2018, Item 3.2 a. “Maximum number of float duplexes” to six (6) and Item 3.2 b. “Maximum number of dwelling units in float duplexes” to twelve (12). That Council direct the applicant to hold a public open house to receive public input with regard to these bylaws prior to consideration of second reading of Bylaw No. 461, 2018. That Council direct staff to prepare a bylaw to amend the Land Use Bylaw to allow for the development proposal presented by Mr. Rondy Dike outlined in the October 10, 2017 meeting. Daniel Martin, Island Community Planner, provided a council report,Council referral resolution, referral letter and presentation regarding rezoning and OCP amendment application for 431 Bowen Island Trunk Road. The applicant was applying to amend the Water Commercial (WC) 1(a) (Marina) zoning to allow an increase from three to nine floating homes. That the Advisory Planning Commission recommend that the proponent of the 431 Bowen Island Trunk Road rezoning application enter into a Housing Agreement with Bowen Island Municipality which stipulates that the float home units will be for the exclusive use of Bowen Island workers from April 1st to September 30th annually; and. That the Advisory Planning Commission support the use of the floating buildings as commercial guest accommodation through the remaining winter season. That the Advisory Planning Commission recommend that BIM Bylaw 461, 2018 be amended to comply with BC Float Home Standards including the Public Health Act Sewerage System Regulation. That the tanks are manually inspected once a year for damage and degradation, and photos or video of such, including a record of water levels, are provided to the municipality. Report from Daniel Martin, Manager of Planning & Development to Mayor & Council presented to Council on October 10, 2017 re: Introduction to Rezoning Application RZ-02-2017. Report from Daniel Martin presented to Mayor Skeels and Council on April 23, 2018. re: First Reading. Report from Daniel Martin presented to Mayor Skeels & Council July 23rd,2018 re: Second Reading. Report from Daniel Martin presented to Mayor Skeels & Council November 13, 2018 re: Council rescind First and Second Reading of Bylaw No. 461, 2018; That Bylaw No. 461, 2018 be read a First time as amended; and That Council refer Bylaw No. 461 to the APC, Islands Trust and Snug Cove Sewer Local Management Committee. Report from Daniel Martin presented to Mayor Ander and Council January 28, 2019 re: Second reading as amended, refer bylaw to a Public Hearing. Report from Daniel Martin presented to Mayor Ander and Council March 11, 2019 re: First reading of Bylaw No. 480, 2019 cited as “Union Steamship Marina Housing Agreement”. Power Point Presentation to Mayor & Council dated October 10, 2017. Power Point Presentation to the Economic Development Committee October 13, 2017. Power Point Presentation to the Advisory Planning Commission October 16, 2017. Power Point Presentation to Mayor & Council dated April 23, 2018. Power Point Presentation to the Advisory Planning Commission May 23, 2018. Power Point Presentation to Mayor & Council dated July 23, 2018. Power Point Presentation to Mayor & Council dated November 13, 2018. Power Point Presentation to Mayor & Council dated January 28, 2019. Power Point Presentation to Mayor & Council dated March 11, 2019. Islands Trust – Policy Statement Directives Checklist only. Islands Trust – Letter to Hope Dallas, Corporate Officer, dated November 28, 2018. Copies of base bylaws are available at Bowen Island Municipal Hall.